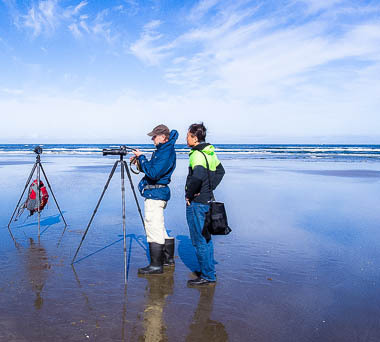 On Saturday, July 13th, our workshop group gathered at the Oregon coast just north of Oswald West State Park for a long day of shooting the endless beauty here. One can never say what the weather will hold in store. 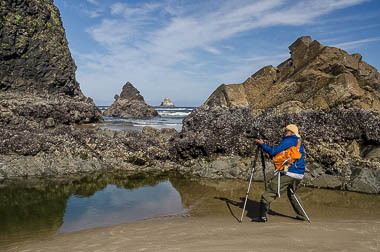 Although July didn't have any rain, the Oregon coast, like the mountains, has it's own weather. The weather gods smiled as we had pleasant but cool and somewhat windy weather. In the morning at Arch Cape, we also had some lovely cirrus clouds slowly and majestically rolling by. 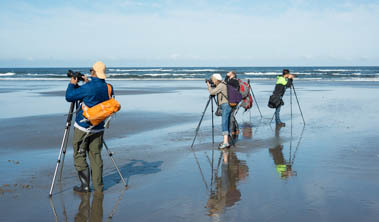 They were here, apparently, just for us, as the areas to the north towards Ecola State Park and to the south were clear. 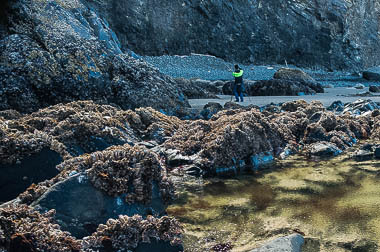 We started at Arch Cape, with an outgoing tide. Great to be out on the beach! We were able to move in to explore south of the Cape, as sand had filled in the gap that was there just a few months ago. Fine waves and beautiful sea stars. Tai lining up a detail shot. After lunch and a two hour review and processing session (whew! ), we headed to the forest of Oswald West State Park and spent some calm time in the grand forest surrounded by the old growth forest of Sitka Spruce, Hemlock and other fine species. Overall shots and details of the forest fauna were abundant. Last stop was the cliffs of Neahkahnie Mountain. Common Muirs, Cormorants and gulls flew close by, traveling to their nests and groups. A special place with wildflowers surrounding the trail. We were protected by the NW wind, so it was quite pleasant as evening approached. 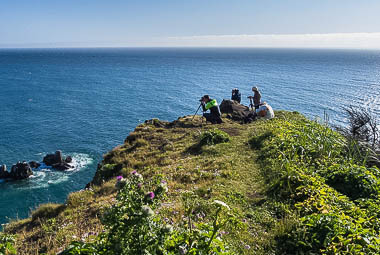 Kira, Preston and Tai shooting from the cliffs. Thanks to everyone for fine company in a grand landscape.